The NFL has officially changed to a pass-heavy, offense-first league, a league where signal-callers and the talent general managers surround them with are paramount. It should come as no surprise then that when you see a successful quarterback, you’re likely to see a successful wide receiver(s). Or vice versa. That’s where DeAndre Hopkins comes in. And that’s why Hopkins has been named our best receiver from the 2018 season. Hopkins had by all accounts a monster season on the receiving end of passes for the Houston Texans, doing so, however, on the receiving end of passes from only our 12th-highest graded quarterback in Deshaun Watson. What Hopkins was able to accomplish this year buoyed Watson’s success as a passer as Hopkins was left to fight for the ball more than any other receiver in football. His 43 contested targets were more than any receiver in the league, and outside of JuJu Smith-Schuster (41) and Julio Jones (40), no receiver in the NFL saw more than 30 contested targets come their way. Quite obviously, Hopkins also led the league with 25 contested receptions, proving his innate ability to come down with the ball as well as his strength to fight up to and at the catch point with defensive backs. He was a threat to catch the ball in any situation just as much as he was a threat with the ball in his hands, tallying 387 yards after the catch and 131 yards after contact on his receptions as well as breaking 12 tackles after the catch. He dominated the league with 81 combined first-down and touchdown receptions and racked up 40 explosive plays of more than 15 yards, third-most in the NFL. It didn’t matter where Hopkins was on the field either, as he was an equal opportune receiver, hauling in 48 receptions when he lined up out wide to the left, 35 receptions out wide to the right and a combined 32 from any of the slot alignments on the inside. In fact, at every alignment he was targeted from this season, he saw a passer rating when targeted well above the league average. The dominance didn’t just end there either for Hopkins as he wasn’t just a one- or two-route trickster. He was targeted at least four times on 11 different route concepts and hauled in at least 50% of his targets on 10 of those 11. The case could be made for him to arguably be the best ‘go’ ball receiver as well as the best on crossing routes as he ripped on 12 receptions on each route and seven of his 11 touchdowns came from these two routes combined. It clearly didn’t matter where he lined up, where he was targeted or whether he had to fight for the ball or not, Hopkins was in a class of his own this season, and it all led to the NFL’s highest overall (92.5) and receiving grade (92.6) at the position. While all of the aforementioned numbers and receiving prowess explained above are good in their own standing, the first and most important goal of any receiver at any level of football is top catch the ball. It’s in the name of the position after all. With that in mind, everything mentioned above is made that much more impressive when it’s taken into account that Hopkins also set the PFF record for most catchable passes thrown his way without a drop this year. His 115 catchable targets without a drop not only set the PFF record, but it also crushed the previous record of 60 held by Randall Cobb that he set back in 2016. 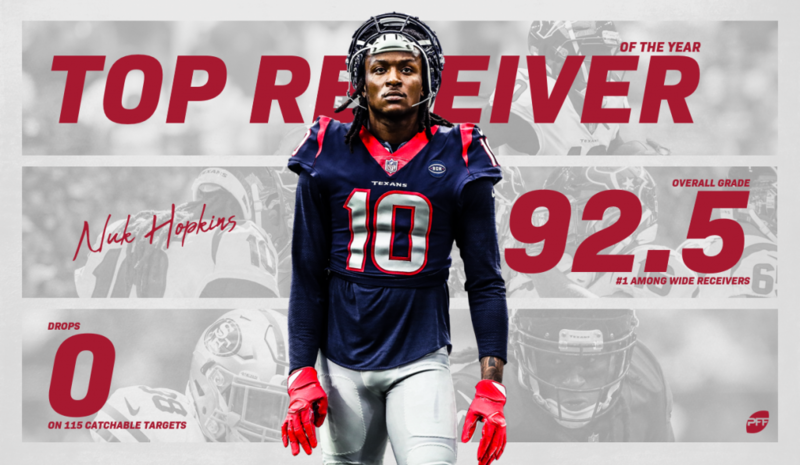 With seemingly every needed tool to succeed as a receiver in today’s NFL in his bag, Hopkins’ selection as First-Team All-Pro is no surprise to us as he, more importantly, was named the most valuable non-quarterback in the NFL this season to boot. It almost goes without saying but we’ll leave it here regardless: DeAndre Hopkins was the best receiver in the NFL this past season.